Melih Youtube: Ensnared By AG Howard. Hello everyone and welcome back to my book reviews. So today I have the third book in the Splintered Series by AG Howard title Ensnared. If you guys haven't picked up this series yet, where are you living? under a rock.. like seriously under a rock 😃😃. This series is, in my opinion, one of the best modern-day retellings of Alice in Wonderland. AG Howard writing reminds me so much of Tim Burton Movies. She is that AMAZING 😻😻 and if you don't believe me, why then buy the books yourself and you will see what I mean. So let's get to the details of the book, shall we? 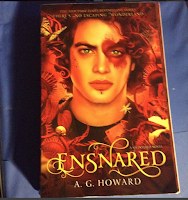 Ensnared is the third book and technically the final book in the series. It is about Alyssa once again returning to Wonderland to fix family problems😂😂. But this book gets more interesting when Morpheus and Jeb finally understand they both have to work together in a way to also help Alyssa and wonderland. It's the final battle in a way between the love triangle 🙀🙀🙀 of the three. So who will it be? Will it be Jeb or Will it be Morpheus? Well, I can't tell you that, Duh. You honestly have to read the books to find out. Trust me though the ending is not something you will be likely to forget 😏😏. So just go already and pick up the series and read it. Finally, I want to say I love the covers on these books. I always seem to forget to mention that but I do love the covers on AG Howard books, they are beautiful and colorful to the right amount. I rated this book a five out of five stars because like the rest I could not put it down. I am still so wrapped up in the series and I finish it in December of 2016. This modern-day retelling will forever be one of my faves and I will always love it to the core of my very soul. Please check it out, all information listed below for the series.